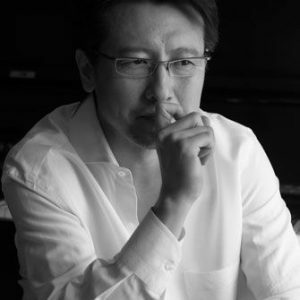 Born in Beijing, Li Gui Jun graduated from oil painting department at the Central Academy of Fine Art, Beijing in 1988 where he continued his education and received his M.F.A in 1995. 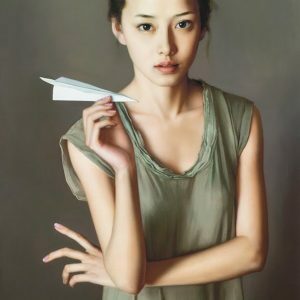 Li Guijun’s work explores the dynamics of women in a photo realistic fashion. They are part of the new school of cynical realism. On the surface the viewer sees exquisitely finished portraits of beautiful women; however beyond this the artist is portraying the ambiguity of women’s new role in china. 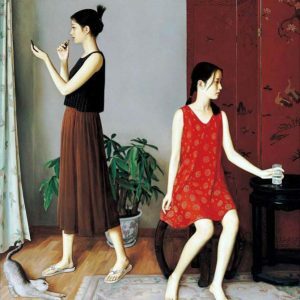 Li Guijun has painted adolescent girls exclusively for almost twenty years. The artist takes Chinese girls as the medium because they are brought up in a simple and disciplined environment, one that they live in their own world, a pure and loving dreamland. During the period between childhood and adulthood, physically and psychologically, they are like buds ready to blossom. His “girl next door” series of works brings the viewer into his inner self to find a moment of silence far removed from the daily pressure.